Man does not live by barbeque alone. Sometimes he needs a cheeseburger. We were in Fredericksburg for a few days over spring break and decided it would give us an opportunity, with a bit of a Jeep ride, to experience what Texas Monthly magazine called the third best cheeseburger in Texas. I was especially intrigued because, in spite of placing two other burgers above it, the staff of the magazine chose to put the Alamo Springs Café burger on the front cover. As is generally the case on spring break, I came to Fredericksburg to meet up with my best friend Kevin, who comes down from Indiana every year to ride in Texas Hell Week, a bicycle gathering for the truly demented. He starts his day before dawn, eats two breakfasts and then rides more than 100 miles in the rugged Hill Country terrain. Then we play in the evenings. That usually starts with dinner and tonight that took us to Alamo Springs. According to the maps, Alamo Springs does not exist. It is a blank spot in the middle of Kendall County about ten miles south of Fredericksburg on a two—and sometimes one—lane blacktop. 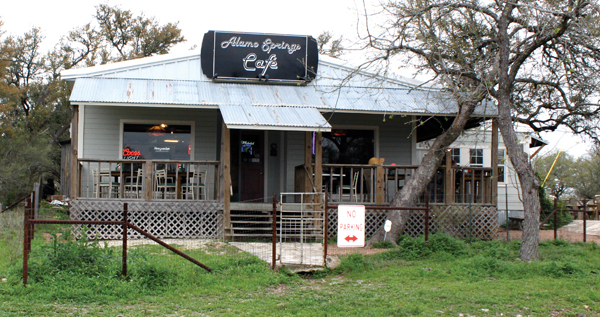 About the only way to find it is to follow the signs to the bat cave at the Old Tunnel State Park and then look for the only other thing in the vicinity; Alamo Springs Cafe. It is really a unique spot to eat. It is so far “out in the sticks” that you would think they would have no business at all. You wonder how anyone could even find the place. But it is always busy and on weekend evenings, even with the two large outdoor dining areas, you could have a considerable wait for a table. Beverages work on the honor system. You pull your beer (or kid’s drinks) right from the coolers there on the restaurant floor, and you save the bottle caps. When it is time to leave, you give the bottle caps to the cashier and she charges you accordingly. We each had a burger that was too large to fit into our mouths and a couple of beers and then settled in to relax and talk about what has transpired in our lives since the last time we were together and about things we should do in the future. It takes a while to get used to Kevin’s communication style. When you say something, there is 30 to 45 seconds of dead air—just about enough time to make you assume he didn’t hear you. At that point you will be tempted to say something else, just to keep the conversation going. But don’t. The response is coming and it will usually be either hilarious or full of wisdom. Often it is both. If you jump the gun, you’ll miss the payoff. We got to talking about things we wanted to do in the next few times we got together. I told him I thought we should add the Running of the Bulls in Pamplona, Spain to our bucket lists. And then I waited—and waited some more. The answer finally came. Yep. As usual, it was worth the wait. Over a number of decades now, I have studied the decisions I’ve made, and the results of those decisions. In doing so, I’ve found a strong correlation between the time I take to make the decisions and the quality of the results I get. Since our lives at any given moment are nothing more or less than the sum total of the decisions we’ve made up to that point, this seems like a worthwhile practice to me. Almost without exception, I find that the quick decisions I make produce bad results. Those that I take my time with turn out to have very positive consequences. Decisions are answers to life’s questions. Should I buy that? Should I date her? Should I take that new job? When you think about it, it is surprising how many “spur of the moment” decisions each of us makes. We provide instantaneous answers to many of life’s questions, and sometimes even to life’s biggest and most important questions. For most of us, we have been doing this for so long that it has become a habit, so much so that now we often produce answers even before we have fully articulated the questions in our minds. And then we wonder at the poor results. My friend Kevin is a great communicator. He takes the time to think about what was said to him, to articulate in his mind the statement that he heard and needs to address, and only then does he make the decision how to respond. He does all of this before he ever says a word. That is why you can be pretty sure that whatever he says will be well thought out, soundly reasoned, and sometimes side-splitting funny. But he is more than a good communicator; he also serves as a good model for approaching the decisions life requires of us all. He doesn’t rush it; he takes the time necessary to get it right. I’m not suggesting that we spend days or weeks agonizing over decisions, analyzing data and trying to predict the future. That can be paralyzing. Instead, just trust your higher self. There is usually no reason to rush. We don’t even need to think much about the question at hand. Just let it simmer. Wait for the answers to come. The human mind has a way of working on problems when we are totally unaware anything is going on. We might be sleeping, doing some mindless activity like washing dishes or running, or even watching TV. All the while, the mind is working non-stop on issues we encounter. For the most part, we are unaware of it and that’s okay. Just let it play out. Don’t rush it. 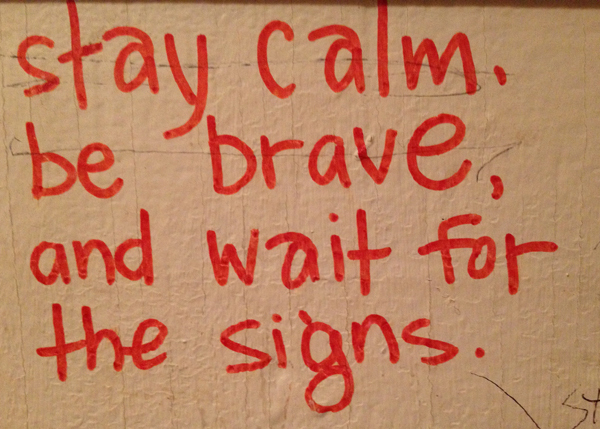 Wait for the signs. The answer will come. When it does, it will be full of wisdom, and it’s definitely worth the wait. By the way, Kevin was right! We can seek death by livestock closer to home. There will be a Pamplona-style Running of the Bulls in Baytown on December 7. Sounds like fun! “Worth the wait.” Hmmmm. . .I can definitely relate to that now that I’m older and (somewhat) wiser!